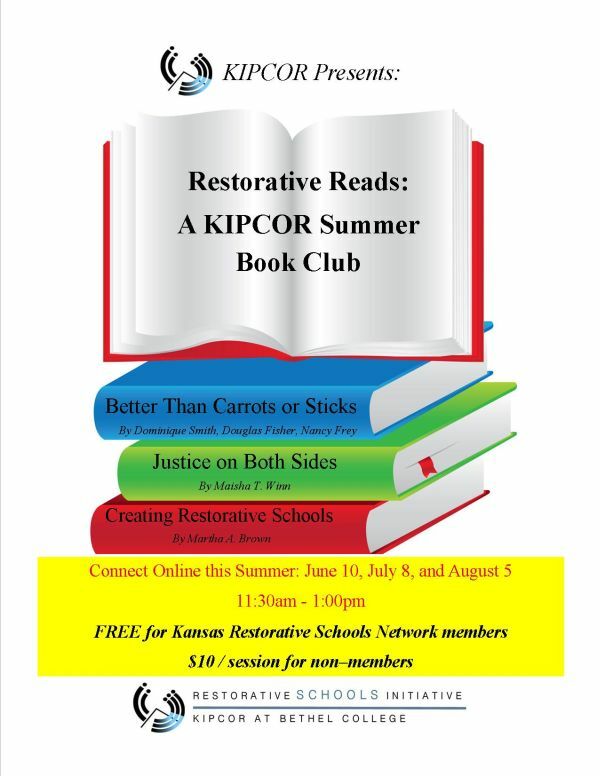 KIPCOR presents three sessions of an online summer book club for people interested in restorative schools. This is your opportunity to connect online with others interested in Restorative Schools in the state of Kansas, to discuss current literature, and to learn from each other. Each of the three sessions will be an online webinar discussion using zoom, and each will be facilitated by members of the KIPCOR Restorative Schools Initiative training team. Registered participants will receive log-in information in advance of each session. The sessions are FREE for Kansas Restorative Schools Network members. For all other participants, sessions are $10 each. Each discussion session will center on a focus text that gives background and support to the practice of restorative justice in schools. In addition, each session will include a small “mini” discussion on an additional book that may be used in the classroom or otherwise of support of restorative justice implementation. Participants are responsible to find and buy/borrow the relevant books as they wish. Pre-reading the texts is not required, but is welcomed and encouraged. Join us! with mini discussion of What Are You Staring At?